We can apply that to building materials- especially CONCRETE. - we know cities which shape themselves like a rose (Prague / Bohemia- see architecture linke below)- create life force- attract money, tourists, vitality and more.. BECAUSE THEY ARE ELECTRICALLY CENTRIPETAL. 1. replace the metal which has a biological poisonous electric field capacitively- with living capacitance (hemp / bamboo )..
we can add the correct - PHASE CONJUGATE ROCK POWDER.. WHICH MAKES IT ALIVE. To understand how the rock powder addition of the correctly charged piezoelectric materials.. works- see how we accomplished that at PYRAPHI.COM (above). Finally- privately we have a partnership with Pat Flanagan - our partner, who is confident from testing that the correct epitaxially charge CRYSTAL ENERGY WATER- can inexpensive nearly double the strength of the molecular bonds in cement. Note image on the bottom left above- from pyraphi.com shows an example of how we use implosive phase conjugate capactive dielectric field 'pyraphi' to pre charge the rock powders. Imagine everything from small containers- to houses - to giant hospitals- where when you walk inside it FEELS like a cathedral. The possibility of creating living electric fields from concrete materials, exists now only AFTER we have learned in general how to define, create and measure- the fractal or bioactive field effect- which originally was called SACRED. produces an electric field called "PHASE CONJUGATE DIELECTRIC"
2. 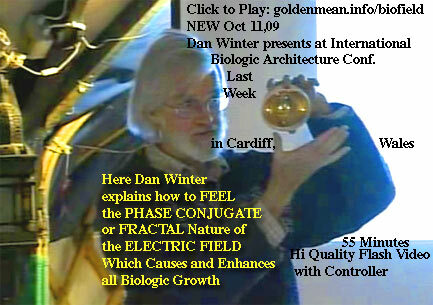 Reduces electrosmog- because the broad spectral conjugating dielectric - eliminates electric fields which are out of phase with biology and planck/ hydrogen- due to the plasma density at field effect focal points (note construction design which actively creates these plasma compression nodes called FRACTAL FIELD- will increase this electrosmog elimination). Philips of Netherlands tried to create electrosmog reducing ceramics- but failed to understand the electrical engineering principle (phase conjugation where 2 pine cones kiss noses in dielectric field lines- is where out of phase field lines are self cancelled). It is well known that this kind of process produces rock sands which will clear up many forms of polluted lakes and ponds (films at plocher.de ). Our newer technology to produce this trigger field- uses a stronger charge field (pyraphi) - and understands the electric field measures to optimize this field (see 3 measurement techniques below). --Dr Korotkov in partnership with us has developed technologies for measuring this created field effect (see below). In summary- when the correct field effect sands are introduced in the concrete mix to create a centripetal charge field- then all of life benefits. See also Davidovits - Ancient Living Geopolymers..
as fractality ( charge compression efficiency is charge distribution efficiency - is life). IS measureable. Simply put - the breath of sacred tingle when you enter sacred space - is now measureable.. The electric field of a building ( its capacitive field - phase conjugate or not) DIRECTLY determines how well seeds germinate ( and everything grows) which would then define sustainability in architecture. You will get the same HARMONIC INCLUSIVENESS (fractality) which doctors use to predict how long your heart (HRV) is going to live. Measure relative seed germination speed, size and success- comparatively in cavities of concrete with and without this electric field. (at the link) Sal Giandinoto our group PhD Chemist repeatedly measured a 40-50% increase in fermentation rate: the only variable was the zero power in correct phase conjugate capacitive field.